Friday is here! Kids are looking forward for the weekend because they will learn how to ride their bicycle. Oh yah! My girl learned before and was just too scared to ride by herself without someone holding the bicycle at the back. We decide that riding bicycle is also a basic skill they have to learn and master. With the upcoming school break next week, they will have a lot of time to practice since hubby will also be on 1-week leave at the same time the kids having their the school break. Today's bento was simple to prepare and simple to decorate. I made 2 chickens from heart shapes chicken nugget and decorated with food picks, fish ball, nori, carrot, and red part from crab stick. Inside the box : chicken nuggets, stir fry chayote, potatoes in sweet soy sauce, grape tomatoes, flower egg, and noodle & green peas. Love the cute chickens! Never got nuggets but it would be fun to try. Can't wait to see pics of your two kids on bikes after the week! Have fun! Tee hee... these chickens look so comfortable in your bento. Almost like their ready to lay an egg for you. Hope your kids have fun riding. How fun! @Indonesia Eats : Yes, that is Kero Keroppi's spoon. It seems Sanrio characters very popular all the time. Thanks Pep! I love the idea of making a chicken out of a heart shape. Very cute and super creative! Your bentos are always so pretty! @OhayoBento : Thanks a lot! Can't take the credit because some Japanese bento moms also use heart shapes nugget in their bento :) I was just inspired by them. good luck teaching A and A to ride, i hope nobody falls down! the chicks are adorable, i espcially love the cute eyelashes on the girl. the bone picks for feet are a good idea too! What a great idea using the heart shape nuggets to make chicken! Very creative! You used chicken nuggets for the chicken :). So cute! I love all the things you can do with a heart shape. @BentoBeginner : Thanks a lot! @prince n princess mum : Thanks a lot for your sweet comment! 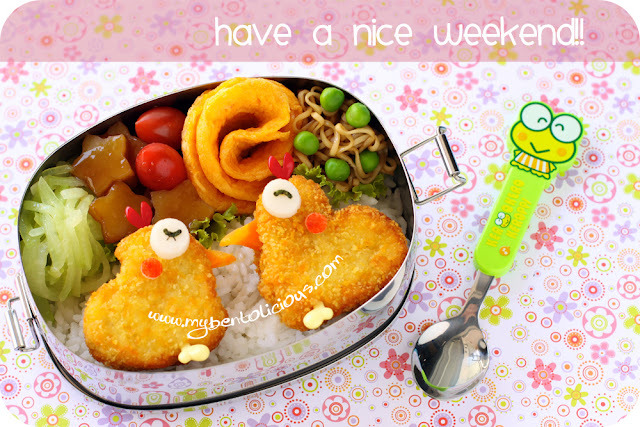 so simple yet so cute and yummy looking...I really like those bentos! @charsiubau : Thanks a lot for your kind comment! These birdie sweeties are so cute...must smooch!! Lovely and precious, Lia!